Sigma Alpha Delta seeks to provide continuous support for its members in their pursuit of valuable communitarian contributions, with a focus on diversity and for the betterment of present and future generations. Sigma members have volunteered at numerous Stop ‘N’ Swap community reuse events, helping to sort and display items dropped off and ensuring a smooth operation from start to finish. Sigma Alpha Delta is one of many groups at Baruch that engage with GrowNYC by volunteering at Swaps, other events, and by working with our sister Greenmarket program. 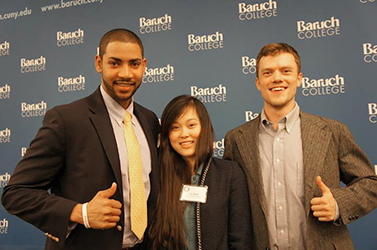 This is just the beginning, as GrowNYC looks forward to providing even more opportunities for Baruch students next semester. Want to volunteer at a Stop ‘N’ Swap or other activity? Check out our volunteer opportunities here! We are truly thankful for the time volunteers commit to helping GrowNYC provide resources for a better NYC. Meet a few of our awesome volunteers! JOE BUCK As an Open Space Greening volunteer with GrowNYC, Joe has led teams of volunteers at Greening's biggest event of the year, the Annual Spring Plant Sale, which distributes plants to over 500 neighborhood garden projects every year. Why he does it: I enjoy the opportunities with GrowNYC and the community gardens because I get to tap into my imaginary “Inner-Gardener” in the midst of the urban jungle. “To be of service” was instilled in me growing up, so it feels natural to lend a hand. Besides, being self-absorbed is far more exhausting. The best part: Getting dirty! My job is a suit and tie. So having the opportunity to dig in the dirt, learn about a flower or vegetable or help create an oasis in what was once an empty lot is magical. It sounds bit corny, but I mean it. The impact: It connects resources with needs! It gives people the opportunity to step out their comfort zones and actually be part of the solution. Each one teach one, right?! NANCY RAPHAEL As a recycling volunteer with GrowNYC, Nancy has helped teach New Yorkers about composting and contributed to successful recycling at large events. Why she does it: I thoroughly believe that it takes a collective effort to make a difference and enjoy working with GrowNYC staff and fellow volunteers who have dedication visible in their faces. I do not view my volunteering experience as giving up my Saturday or Sunday, or as sacrificing my sleep. Instead, I see it as contributing my time to making a big difference in changing the carbon footprint of New York and I am proud to be a part of such a large task. The best part: The fun of engaging with New Yorkers and asking them to take care of the city they live in and think of the world they are a part of as well as connecting with fellow volunteers. I also enjoy the camaraderie between recycling volunteers that makes for a successful effort. The impact: As people become more and more conscious, they will feel compelled to volunteer their time and recycle at home and everywhere they may be--picking up stuff on the ground or advising others to recycle. ERIN EASTERN As a Greenmarket volunteer with GrowNYC, Erin staffs Union Square Greenmarket's Market Information Station and answers customer questions while assisting with cooking demonstrations and other market promotions. Why I do it: I volunteer because I believe in the farmers market/food justice movement and enjoy being helpful to the Market Managers so that they can run one of the best Public Markets in the world. I am proud to be a small part in the success of Greenmarket. Also, I love being outside rain or shine. As an indoor worker during the week, I genuinely miss the time I spent working outdoors and the feeling of being out there (especially when the weather is beautiful, of course). The best part: Having a community that is separate from my work, family, and friends. The people I meet through Greenmarket cross the usual cultural boundaries (e.g. urban/rural, young/old, farmer/organizer) and broaden my social world. I enjoy meeting the other volunteers and learning how they came to Greenmarket; making new friends that also have an interest in food justice, urban growing, CSA's, and a myriad of other cool things unrelated to food like film studies, United States law, and sports. The impact: The larger impact of Greenmarket is huge and I like thinking about how I am part of what they accomplish: Encouraging New Yorkers to interact with their food producers and learn where their food comes from; providing underserved communities access to fresh, healthy foods; creating a learning environment for schools and media; incubating small businesses and helping farmers to stay on their land. 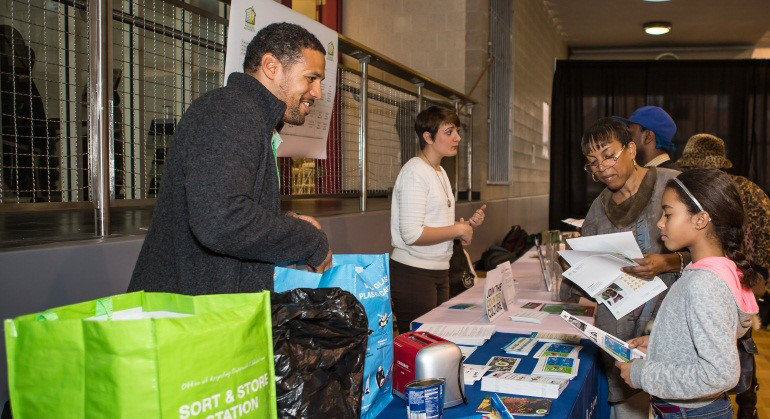 We asked some questions to Michael Mullaley, age 25, an Office of Recycling Outreach & Education volunteer who has been volunteering with us almost every weekend and who has made promoting composting a passion of his ever since moving to NYC from Oregon. Check out our conversation on his volunteerism! OROE: What prompted you to volunteer with OROE? Michael: I majored in Environmental Studies in college and have been doing various conservation work over the last couple years. After moving to New York City, I wanted to learn about, and get involved with, environmental organizations here and some of the work that they are doing. OROE’s volunteer opportunities to get out on the ground, talk to people and help educate them about recycling and composting really appealed to me. Also, I wanted to personally learn more about recycling in NYC since guidelines are a little more specific here than back in Oregon. OROE: What was your best experience volunteering with OROE so far? Michael: I have two. I really enjoy working up at Inwood because of the sense of community that is generated at a farmers market. All the community members make me feel right at home. The other best experience came when I tabled at the Chinese New Year recycling event. It was very exciting to see the young kids get enthusiastic about the recycling game, and was quite impressive how quickly they picked up all the various details. OROE: Have you always been a recycling enthusiast? Michael: Definitely. I was born and raised in Portland, Oregon, where recycling is second-nature. There are much fewer recycling-specific constrictions on items, which makes the overall experience simpler and less confusing. The city’s recycling infrastructure is very well organized too. OROE: What’s your environmental policy? Michael: Try and do things that limit my ecological footprint, which means becoming more aware of my actions and its impact on my surroundings. Develop sustainable habits in your everyday life (ie energy and water conservation, public transportation, recycling, collecting food scraps, buying less “stuff”), while trying to get involved with groups and organizations to have a greater environmental impact. Also, it has become a passion and priority to just get out and enjoy nature. Not only is it a chance to revel in the many gorgeous American landscapes, but it helps to put a face on that which is threatened by anthropogenic actions, and why it is so important to conserve, protect and fight for ecosystems. OROE: What’s your personal philosophy? Michael: Always be kind, work hard, and be open to new experiences. OROE: What is your favorite thing about living in New York? Michael: The wide diversity of people, cultures and languages here are incredible. I also love the public transportation, city parks and the surprisingly large amount of community gardens. 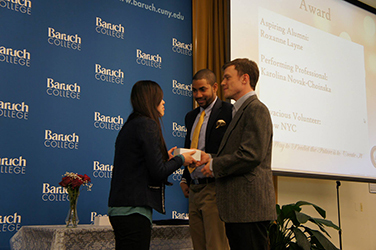 OROE: What is your favorite thing about volunteering in New York? Michael: Meeting all sorts of people and listening to their individual stories. 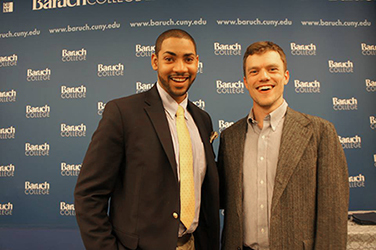 OROE: Has volunteering with OROE helped you see New York or New Yorkers in a different light? Michael: New York is more sustainable than people give it credit for. But there is still plenty of recycling and compost education to be done! OROE: What upcoming events are you signed on to volunteer for with OROE? Michael: Compost collection at Inwood, and Earth Day recycling education. OROE: What are the benefits of volunteering with OROE? Michael: You get to talk to people about environmental issues and help empower them to take action. In general, you have a chance to give back to the community, support a cause you believe in, gain additional experience you might not have had, and, of course, meet people.